The Canadian Silver Owl 1 oz belongs to the Birds of Pray Series from the Royal Canadian Mint. This is the last of the four coins that have been realeased. Each in the series contains 1 pure oz of fine silver (9999) which is manufactured using the highest production standards in the business. The Royal Canadian Mint is internationally recognized for purity and minting detail so these sparkling 1 oz silver coins are easy to price, very liquid either in buying or selling and directly follow the worldwide price of silver. The Royal Canadian Mint has done a fine job at highlighting the Canadian Silver Owl 1 oz and the Queen on this pure silver coin. Both are brilliant against a matte coin surface creating a beautiful cameo that is stunning in look and design. Queen Elizabeth II is featured on the front of the Canadian Silver Owl 1 oz coin as well as its legal tender value ($5) and the date of manufacture. The legal tender value is largely symbolic but adds a special plus to the Canadian Silver Owl 1 oz coin and singles it out as being produced by a sovereign nation. This guarantee by the Royal Canadian Mint as to purity and weight is also a big plus for silver bullion investors worldwide. This beautifully made Canadian Silver Owl 1 oz coin falls into the category of what we call “limited edition” bullion products. The Canadian Royal Mint will limit production of the Great Horned Owl 1 oz and while this coin is primarily a silver bullion choice the limited production over time does add an extra plus for investors. The Canadian Silver Owl 1 oz coin is available in virtually indestructible white plastic tubes which hold 25 mint coins with blue sealed tight tops. 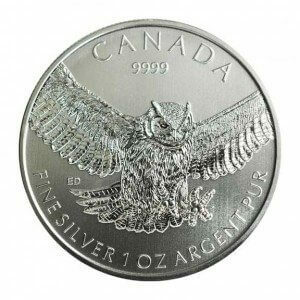 GoldDealer.com also carries the famous Canadian Silver Owl 1 oz in Monster Boxes of 500 1 oz coins. This beautiful blue custom box contains 20 tubes of 25 coins each and can be safely shipped anywhere in the country because of its unique and rugged design.